Paul’s Vision, are there Contradictions? The more people discover the hard to understand writings of Paul, it seems that within the Hebrew Roots Movement, more and more are starting to accuse Paul of being a False Prophet. There are many accusations coming from unlearned and unstable people trying to discredit Paul’s writings and eventually, the validity of the Brit-Chadasha(New Testament) scriptures. Today, we are going to discuss one of the accusations that really has been a stumbling block for many, and if even one minute detail is missed, can make the four accounts of Paul’s vision SEEM to contradict one another, but as Peter warns, this is the result of unlearned people misunderstanding His writings and this leads to their own destruction. 2Pe 3:15 And count the patience of our Lord as salvation, just as our beloved brother Paul also wrote to you according to the wisdom given him, 16 as he does in all his letters when he speaks in them of these matters. There are some things in them that are HARD TO UNDERSTAND, which the IGNORANT AND UNSTABLE TIST TO THEIR OWN DESTRUCTION, as they do the other Scriptures. 17 You therefore, beloved, knowing this beforehand, take care that you are not carried away with the ERROR OF LAWLESS PEOPLE and lose your own stability. When people start to think that Paul teaches against the Torah/Law of Moses, they start looking for reasons to accuse Paul, instead of doing as the Bereans did and searching the scriptures to understand if Paul’s claims were Truth. One of the accusations that is becoming more and more prevalent is the accusation that Paul’s vision records do not match and contradict one another, but what we will find today is that when placed in context, and looking at all the details, they match flawlessly as all of Paul’s writings do when placed in the correct context. The four accounts of Paul’s vision can be found in Acts 9, Acts 22, Acts 26, and Galatians 1. It is interesting to me that there are four separate accounts, and I have found that the four accounts build upon one another as all the scriptures do when using the Hebraic Interpretational processes called PaRDeS. We will use the PaRDeS interpretational rules to show that Paul’s vision was indeed not contradictory, and in all actuality, quite flawless and very interesting. The firs account of Paul’s vision is found in Acts 9. I will be pointing out the details we must see in order to understand the fullness of the accounts. Act 9:1 But Saul, still breathing threats and murder against the disciples of the Lord, went to the high priest 2 and asked him for letters to the synagogues at Damascus, so that if he found any belonging to the Way, men or women, he might bring them bound to Jerusalem. 3 Now as he went on his way, he approached Damascus, and suddenly a light from heaven flashed around him. 4 And falling to the ground he heard a voice saying to him, “Saul, Saul, why are you persecuting me?” 5 And he said, “Who are you, Lord?” And he said, “I am Jesus, whom you are persecuting. 6 But rise and enter the city, and you will be told what you are to do.” 7 The men who were traveling with him stood speechless, HEARING THE VOICE but SEEING NOONE. 8 Saul rose from the ground, and although his eyes were opened, he saw nothing. So they led him by the hand and brought him into Damascus. 9 And for three days he was without sight, and neither ate nor drank. 10 Now there was a DISCIPLE at Damascus named Ananias. The Lord said to him in a vision, “Ananias.” And he said, “Here I am, Lord.” 11 And the Lord said to him, “Rise and go to the street called Straight, and at the house of Judas look for a man of Tarsus named Saul, for behold, he is praying, 12 and he has seen in a vision a man named Ananias come in and lay his hands on him so that he might regain his sight.” 13 But Ananias answered, “Lord, I have heard from many about this man, how much evil he has done to your saints at Jerusalem. 14 And here he has authority from the chief priests to bind all who call on your name.” 15 But the Lord said to him, “Go, for HE IS A CHOSEN INTRUMENT OF MINE TO CARRY MY NAME BEFORE THE GENTILES and kings and the children of Israel. 16 For I will show him how much he must suffer for the sake of my name.” 17 So Ananias departed and entered the house. 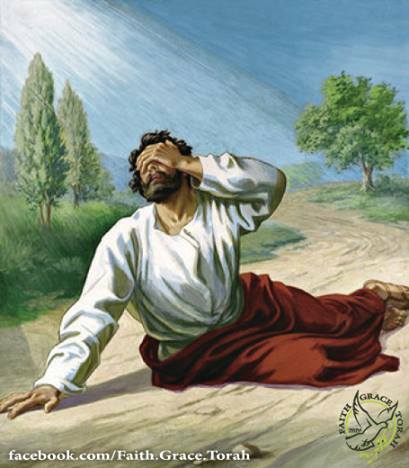 And laying his hands on him he said, “Brother Saul, the Lord Jesus who appeared to you on the road by which you came has sent me so that you may regain your sight and be filled with the Holy Spirit.” 18 And immediately something like scales fell from his eyes, and he regained his sight. Then he rose and was baptized; 19 and taking food, he was strengthened. For some days he was with the DISCIPLES at Damascus. There are several details we need here to understand what happened. The first is that the men who were with Paul heard the voice of Yeshua but saw NOONE, they could not see any person, this will be very important in understanding the accusations made about Paul. The second we need to see is that Ananias was called by Yeshua to lay hands on Paul and impart the Holy Spirit on Paul, so that he may be healed of His blindness. Ananias was not told to give Paul any instructions other than what he had been called and chosen to do. There were no instructions concerning the delivering of the Gospel to Paul by Ananias, the only thing Ananias was told is that Paul had been a chosen vessel and that he would be used as a witness to the Gentiles, and to Kings, and to the Children of Israel. You will see later on why understanding this detail is very important in defending the accusations against Paul. Now, on to the second account of Paul’s vision in Acts 22. So, we have more details added in this account. As I stated earlier in this article, there are four accounts, and the four accounts in the PaRDeS form, build details among each other, leyer by layer. Here, we see how Ananias was instructed to tell Paul of His calling and Mission. He did not tell Him anything about Yeshua, or the Gospel, only that he had been called and chosen to bear witness to what he had seen and heard by Yeshua. In the first account in Acts 9, we are told that the Soldiers that was with Paul saw NO PERSON. We were not told in that account that they had seen the light. This is part of the things that the anti-Paul crowds will use saying that the accounts are contradicting. The accounts are in no way contradicting in any way, they never saw any person as recorded in the first account, but in this account we see that they did indeed see the light, but still no person, as Paul himself saw no person. We see here that Paul went back to Jerusalem to the Temple to pray, which is not in the first account, and he was told to flee Jerusalem quickly because them in Jerusalem would not accept His testimony. NO MAN told Paul this, it was received in a vision and delivered by Yeshua Himself.. This is also a very important detail we must see to defend the accusations against Paul. Now, on to the next account in Acts 26 with King Agrippa. Act 26:1 So Agrippa said to Paul, “You have permission to speak for yourself.” Then Paul stretched out his hand and made his defense: 2 “I consider myself fortunate that it is before you, King Agrippa, I am going to make my defense today against all the accusations of the Jews, 3 especially because you are familiar with all the customs and controversies of the Jews. Therefore I beg you to listen to me patiently. 4 “My manner of life from my youth, spent from the beginning among my own nation and in Jerusalem, is known by all the Jews. 5 They have known for a long time, if they are willing to testify, that according to the strictest party of our religion I have lived as a Pharisee. 6 And now I stand here on trial because of my hope in the promise made by God to our fathers, 7 to which our twelve tribes hope to attain, as they earnestly worship night and day. And for this hope I am accused by Jews, O king! 8 Why is it thought incredible by any of you that God raises the dead? 9 “I myself was convinced that I ought to do many things in opposing the name of Jesus of Nazareth. 10 And I did so in Jerusalem. I not only locked up many of the saints in prison after receiving authority from the chief priests, but when they were put to death I cast my vote against them. 11 And I punished them often in all the synagogues and tried to make them blaspheme, and in raging fury against them I persecuted them even to foreign cities. 12 “In this connection I journeyed to Damascus with the authority and commission of the chief priests. 13 At midday, O king, I saw on the way a light from heaven, brighter than the sun, that SHONE AROUND MEAND THOSE WHO JOURNEYED WITH ME. 14 And when we had all fallen to the ground, I heard a voice saying to me in the HEBREW LANGUAGE, ‘Saul, Saul, why are you persecuting me? It is hard for you to kick against the goads.’ 15 And I said, ‘Who are you, Lord?’ And the Lord said, ‘I am Jesus whom you are persecuting. 16 But rise and stand upon your feet, for I have appeared to you for this purpose, to appoint you as a servant and witness to the things in which you have seen me and to those in which I will appear to you, 17 delivering you from your people and from the Gentiles–to whom I am sending you 18 to open their eyes, so that they may turn from darkness to light and from the power of Satan to God, that they may receive forgiveness of sins and a place among those who are sanctified by faith in me.’ 19 “Therefore, O King Agrippa, I was not disobedient to the heavenly vision, 20 but declared first to those in Damascus, then in Jerusalem and throughout all the region of Judea, and also to the Gentiles, that they should repent and turn to God, performing deeds in keeping with their repentance. 21 For this reason the Jews seized me in the temple and tried to kill me. Here we do get a bit of a different account. Paul says here that Yeshua instructed him in the vision of His mission, yet we see in the other accounts that he was instructed in his calling and Mission by Ananias, a disciple in Damascus. Why did Paul leave this out in this account? With PaRDeS we must understand that sometimes it is not what is present in the text that is important, but what is missing. The Account of this event is a re-telling of the account in Acts 9 and 22. The mystery surrounds the FACT that indeed, Paul did leave out the testimony of Ananias the Disciple from Damascus, but WHY is the question we must ask. To the unlearned this is simply a contradiction in the accounts, but to one who understands Jewish Halacha, the leaving out of Ananias’s testimony makes perfect sense. You see, Ananias was not a Jew, he was not Jewish by blood, nor was he yet a converted Proselyte, but he was a “ger”, or in plain English, a Gentile who was God fearing and in the process of conversion, a student within Judaism that has not yet fully converted to the status of a member of the Commonwealth of Israel. At this point in time, when Ananias received the vision concerning Paul, the message of the Salvation to Gentiles had not yet been given in it’s fullness, and the Jerusalem Counsel had not yet been convened. We understand now that we are saved by Grace through Faith, because we have Paul’s letters as well as the Gospel accounts to testify of this, but in the point in time prior to Paul’s calling, the process of Salvation for Gentiles according to Orthodox Halacha was still being practiced by the Apostles and unbelieving Jews. It was revealed all the way back in the beginning(Exodus 12:48-49), but at this point in time, the Apostles were still practicing the traditions they were raised in. Yeshua had to correct Peter of this issue in His vision of the unclean animals in Acts Chapter 10. Notice what is said about Ananias in the accounts. Act 22:12 And one Ananias, A DEVOUT MAN ACCORDING TO THE LAW, having a GOOD REPORT OF ALL THE JEWS THAT DWELT THERE,13 Came unto me, and stood, and said unto me, Brother Saul, receive thy sight. And the same hour I looked up upon him. To the unlearned and untrained eye, this would simply be a Jewish Disciple of Yeshua, but to the trained eye, this man was no Jew, but a Gentile proselyte in process of conversion. The same wording is used to describe the Roman Centurion Cornelius. Notice that Cornelius is not a Jew, but of another Nation. Act 10:24 And on the following day they entered Caesarea. Cornelius was expecting them and had called together his relatives and close friends. :25 When Peter entered, Cornelius met him and fell down at his feet and worshiped him. 26 But Peter lifted him up, saying, “Stand up; I too am a man.” 27 And as he talked with him, he went in and found many persons gathered. 28 And he said to them, “You yourselves know how unlawful it is for a Jew to associate with or to visit ANYONE OF ANOTHER NATION, but God has shown me that I should not call any person common or unclean. This is not a commandment found in the Torah of Moses, but in the Oral Traditions of the Pharisees, also known as the Talmud. NOWHERE in the Torah/Law of Moses is it said it is UNLAWFUL for a Jew to visit a man of another Nation. Why is this fact that Ananias being a “ger” or a proselyte in the process of conversion important as to why Paul left out His testimony to the Courts and King Agrippa? The accusations had come from the Jews, and Paul, being a Pharisee, understood that in the laws of the Jews, no “ger” or proselyte could witness in a Rabbinical court. Paul was facing death according to the accusations brought by the Jews, and as a Roman citizen, he deferred to the Tribunals of Ceasar, in which he was found guiltless. Ananias was not mentioned because of the consequences that would be brought against Him by the Jews, because according to the Oral Traditions also known as Talmud, a proselyte cannot be a witness in a Rabbinical Court except to witness against another proselyte. See, for starters, TB Yevamoth 101a-102b. The Talmud there establishes that a “ger” (proselyte) may not be part of a “Beth-Din” (i.e. rabbinic court) of three [judges], except to adjudicate a case involving another “ger.” This is undisputed Halacha, for all practical purposes; see Rambam, Hilchoth Sanhedrin 2:9 and 11:11. Add to that list the Shulchan Arukh (Yoreh De’ah 269), the Rid (Tosefoth Rid Qidushin 76b), the Ramban (Yevamoth 45b), the Rosh (Qidushin 76b), the Or Zarua, and the Semaq. Now we have the reasoning of Paul leaving out the testimony of Ananias. He did this to avoid further complicating issues with the already hostile Jews that were accusing Him, and in the process also protecting the Disciple. Another consideration is that Ananias was not present at this time to be able to testify to King Agrippa, possibly because he was dead by this point, or that he was from Damascus. Either way, it is not a contradiction that Paul left out the testimony of Ananias in any way. All the facts of the accounts remain the same, that Paul was called, chosen, and confirmed by a witness to the calling he had received by Yeshua Himself. The facts are that those Soldiers who were with Paul saw the light but no person, heard the voice but did NOT UNDERSTAND what was spoken. Why could they not understand? The Soldiers who were accompanying Paul to Damascus were ROMAN Soldiers appointed by Herod(Acts 12:1-4), and could not understand the Hebrew Language that Yeshua spoke to Paul. The FACT is Ananias never gave Paul any instructions as to what he was to preach except to be a witness to what he had seen and heard, no MAN instructed Paul in the Gospel, which brings us to the last part of the four vision accounts of Paul. Again, it is very important to see all the details else it would seem that there may be a contradiction. Gal 1:11 For I would have you know, brothers, that the gospel that was preached by me is NOT MAN’S GOSPEL. 12 For IDID NOT RECEIVE IT FROM ANY MAN, NOR WAS I TAUGHT IT, but I received it through a revelation of Jesus Christ. 13 For you have heard of my former life in Judaism, how I persecuted the church of God violently and tried to destroy it. 14 And I was advancing in Judaism beyond many of my own age among my people, so extremely zealous was I for the traditions of my fathers. 15 But when he who had set me apart before I was born, and who called me by his grace, 16 was pleased to reveal his Son to me, in order that I might preach him among the Gentiles,I DID NOT IMMEDIATELY CONSULT WITH ANYONE; 17 NOR DID I GO UP TO JERUSALEM TO THOSE WHO WERE APPOINTED APOSTLES BEFORE ME, but I went away into Arabia, and returned again to Damascus. 18 Then after three years I went up to Jerusalem to visit Cephas and remained with him fifteen days. The accusation is that here Paul says he did not immediately consult with any man, so the accusers say that he did consult with Ananias, making this a contradiction, but that is not what is being said. Paul did not consult with any man what he was to preach, no man taught Him the Gospel he received, he received it by direct Revelation of Yeshua Messiah. Ananias did not teach Him the Gospel, he only told Him that Yeshua had said he was to be a witness to what he had seen and heard and of his calling and mission. If we take things out of context and try to read into the scriptures things that are not there, we can basically do what we want to make the scriptures appear as a contradiction, especially in Paul’s case. The next accused contradiction is that Paul says he did not go to Jerusalem, yet we know Paul went to Jerusalem to pray at the Temple, but that is NOT what Paul said. What he actually said was “NOR DID I GO UP TO JERUSALEM TO THOSE WHO WERE APPOINTED APOSTLES BEFORE ME”, in which he most certainly did not do. Why? Because through a vision Yeshua told him that those in Jerusalem would not believe his testimony. We heard right from the beginning on the warnings of Peter that much of what Paul speaks and teaches is hard to understand by unlearned individuals, and that misunderstanding His teachings leads to self -destruction, as well as lawlessness. I pray that this teaching will be presented to the Anti-Paul sects within the Hebrew Roots Movement, because we will be judged according to every careless word we utter. “Let God be true, but every man a liar; as it is written, That thou mightest be justified in thy sayings, and mightest overcome when thou art judged.” Amein Amein!